Writing proposals and reports to funders can be one of the most stressful parts of working in the social change sector. To make it less nerve wracking, it can be helpful to remember that funders are just people. Many of them have also worked for non-profit organisations, social movements or government departments, and understand the challenges of working in this space. They probably do the work they do because they are passionate about social change. They care about human beings, not just numbers. At the end of the day, they want to support important social change work, and help it to succeed. Not all funders are the same, and there isn’t one right format for a good proposal or report. However, we thought it might be helpful to give you some feedback and tips based on approaches that we appreciate when reviewing such documents. It’s usually easier – and quicker – to write a long report than a short one. It’s okay to start with a long document, but make sure you edit it down. Ask yourself questions like, “Can I say this in a shorter way?”, “Does this sentence/paragraph add important, new information?” and “Did I already explain this in another part of the report?” If editing isn’t your strong suit, ask for help. When you report on your activities and outputs, make sure you go beyond simply sharing “what you did”, to asking yourself, “so what?” Funders want to know what you are learning, and why it matters beyond your organisation. Digging into the “so what” shows funders that you’re not blindly ploughing ahead or chasing targets, but that you are thinking critically about your work. What challenges did you encounter, and how did you respond? What mistakes did you make? What will you do differently in the future? What assumptions were built into your plans? Did any of your assumptions turn out to be untrue? Why does your work matter to civil society more broadly? What could other organisations learn from your experience? Make the most important information easy to find. Funders are as busy as you are. They usually have to report upward, to boards or investment committees, and they will probably come back to your report later to identify and share key information. When you make it easy to understand your work, it is easier for them to engage with you and help you – and they are more likely to want to do so. It also shows that you are engaging meaningfully with your own data and high-level findings. When key information is scattered and buried, it’s hard for funders to draw useful lessons from the work – and if they can’t do this, they won’t be able to tell if you are doing it, either. Numbers by themselves are not enough to understand the complicated social dynamics of delivering programmes, but they are a critical piece of the puzzle. If you are specific about the scope of your work and the trends that are emerging, it helps funders focus on what you’re achieving and learning. Use tables or graphs to summarise – don’t bury or scatter key numbers in your narrative. Report against targets, and make sure the targets match your original proposal (or if they changed during the year, explain why). Use comparisons – report figures from previous years to give context, and use control or comparison groups if appropriate. If you’re reporting percentages, include the underlying numbers too, especially if you are talking about small numbers. Specify whether you’re talking about “percent change” or “percentage points change”, and don’t average percentages for multiple groups. More information about these common mistakes, and examples of how to fix them, are available here. Make sure your submission is professional. Make sure your work is carefully edited and formatted so it is easy to read. This includes using consistent fonts and font sizes throughout, writing out acronyms the first time you use them, and making sure each piece fits together in a logical way. Ask someone with a knack for editing to help if you need it. We live in a multilingual country, yet most reports are written in English. It’s okay if your grammar and punctuation is not perfect, as long as the way you communicate is clear. However, when a sentence trails off in the middle, or a document is full of spelling errors, it suggests that the document was written very quickly without enough care and effort. Often, we start drafting proposals and reports by copying and pasting text from different places into a new document. Sometimes, different people in an organisation are responsible for writing different sections of a draft. These are both good strategies to start with, but it means different sections will have different voices and styles, and you may cover the same information in different places. Make sure to edit the document so that the tone and flow of the writing is consistent. In the real world, nothing goes exactly as planned. 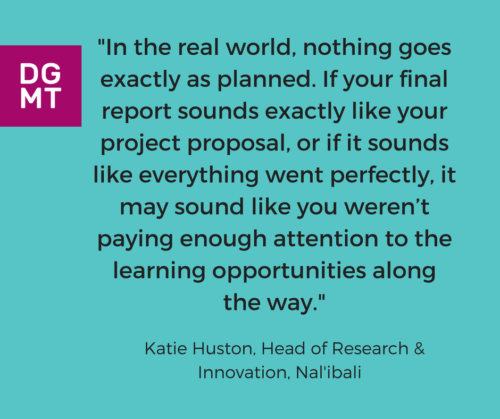 If your final report sounds exactly like your project proposal, or if it sounds like everything went perfectly, it may sound like you weren’t paying enough attention to the learning opportunities along the way. Funders want to support organisations with integrity. Being honest about your challenges – and sharing the proactive steps you’ve taken to overcome them – helps build trust. It also helps funders better understand the on-the-ground realities that affect your work, which helps them make better decisions about what to support in the future. Development work is a journey, not a destination. Human beings are primed to learn through stories, and funders want to know about the human beings behind the numbers. Sharing some specific examples or case studies of how the project has helped people can bring your communication to life and make it more powerful. These stories do not need to be “rags to riches” stories that commodify the lives and stories of people you serve – real life almost never works this way. They should be honest. All the tips above take time to do well. Often the #1 difference between a mediocre report and an excellent report is whether the organisation waited until the last minute to write it, or whether it had time to edit carefully – a great opportunity to use this checklist. The above principles apply to both reports and proposals. However, the “ingredients” or structure of a proposal and a report are not exactly the same. Below, some of the key ingredients of proposals and reports are listed and explained. You can use these as a checklist when you are putting together documents for funders. How do I ask for support from a funder? Some funders use online application forms with set questions and word limits. Others simply ask for a proposal, without guidelines about what you should include. Either way, most proposals should include most or all of the elements below. A high-level explanation of what you want to do, and what you want from the funder, should be at the beginning of the proposal, including the amount of money you want. Don’t bury your ask at the end. Why does your organisation or project exist? What problem are you trying to solve? Your problem definition should be specific. Instead of saying “the quality of health care is poor,” tell us what “poor” looks like: does this mean long lines? Medication stock-outs? Service delivery cuts that prevent quality care? Is it getting worse over time? What are the root causes? How does it affect the people who need these services? When possible, use research and data to inform your problem analysis. wazimap.co.za is a good source for census data about the areas in which you are working. If you work in the early childhood development (ECD) sector, wazi-ecd.org.za is also a good resource. Make sure you use referencing to cite any research or data you use. Your problem definition should also be clearly linked to your response. If you define your problem as “poverty in South Africa”, and your response is to “prevent teen pregnancy in one specific township,” your problem and response are not well linked. Your problem is very general, complex and widespread, with many contributing factors, while your response is specific and focused. Funders get proposals from many different organisations that do similar work. They often work in the same geographical areas, or have very similar approaches. What makes your proposal unique, innovative or important? Do you have a novel, new solution to a problem many people have tried to solve? Do you have a better success rate than other, similar programmes? Are you the only organisation providing your services in a specific geographical area? It is important to show that you have thought carefully about your approach, why you believe it will work, and what it seeks to achieve or change. If you do not have a theory of change for your organisation, this resource can help you to develop one. Make sure it is clear how you plan to achieve your goal, including time-frames and targets. How often does each of your key activities take place? Who does it? How do they do it? How many people/schools/clinics etc. will be involved? Don’t promise to measure dozens of things you won’t be able to track very well. Rather, identify a handful of specific indicators that will help show whether you have achieved your goals, and focus on tracking and evaluating these carefully during the course of your project. Choosing fewer indicators shows that you have thought carefully about the question, “How will we know if it’s working?” Conversely, choosing 20 indicators suggests that the goal of the project may not be crystal clear. You can find more help with developing M&E frameworks here. Your budget should tell the story of what you are planning to do, and explain how you calculated the amounts you need. Including photos, when it is possible, can be helpful to paint a picture of your work in a more visceral, compelling way. Photos are especially useful when they help show the context in which you are working; depict new products or approaches, like a new mobile app or product; and show your work in action. These do not have to be professional photos – but they should be carefully chosen to provide information over and above what you can portray in writing. How do I tell a funder about the work they have supported? Just like proposals, there is not one right format for a report, and many funders have specific formats they will ask you to use. However, this checklist can help you make sure you cover the key ingredients of a good report, regardless of format. This can be short, but it’s good to remind the reader what your project is about. Even if you have a long-standing relationship with the person reading your report, you should write the report so someone who does not know the project well can also understand it. Briefly summarise what your project set out to do and achieve. It’s a good idea to refer to your original proposal. This section might also include what you wanted to learn, or questions you wanted to answer. Activities: what did you do? Outputs: how many people were reached? How many people graduated from your programme? Outcomes: what is changing due to the work? If your plans or targets changed along the way, you can explain what changed and why. To learn more about activities, outputs and outcomes, please visit this resource. What challenges did you face, and how did you respond? When goals weren’t met, were exceeded, or changes happened along the way, how and why did this happen? Was it because of factors you could control (for example) or things you could not control (for example, bad weather, staff turnover)? What did you learn from this? Will the project continue? Will it grow, scale back or change? Will you continue to work or support with the people involved? Is there a bigger “so what” – for example, will you share your model with other organisations, or did you forge a new partnership with a local clinic, school or library? Katie Huston was DGMT’s Creative Learners portfolio manager from 2014-2017. She now heads up research, monitoring and evaluation, and innovation at the Nal’ibali reading for enjoyment campaign.